I was out thrift shopping a couple of weeks ago when I ran across these very cool ceramic pumpkins. Now, granted, they didn't look like much in the thrift store - being all brown and shiny but, I knew I could make them something totally different that would fit into the decor of our home. Most of my Fall decor is done with the amazing colors Mother Nature sets before us at this time of year - yellows, oranges, rusts, and browns. But, sometimes I like to switch things up a bit. This year I am doing a lot of neutrals in my living/dining room with some touches of blue. So, I decided to paint these not so pretty brown pumpkins blue. I began by sanding them first to take off the sheen and try to give the surface a bit of tooth to accept the paint. I didn't take pictures of the painting process but I painted both pumpkins with Valspar's Journal Book - a blue that I use on a lot of my projects. I buy it in the sample jars at Lowe's hardware. 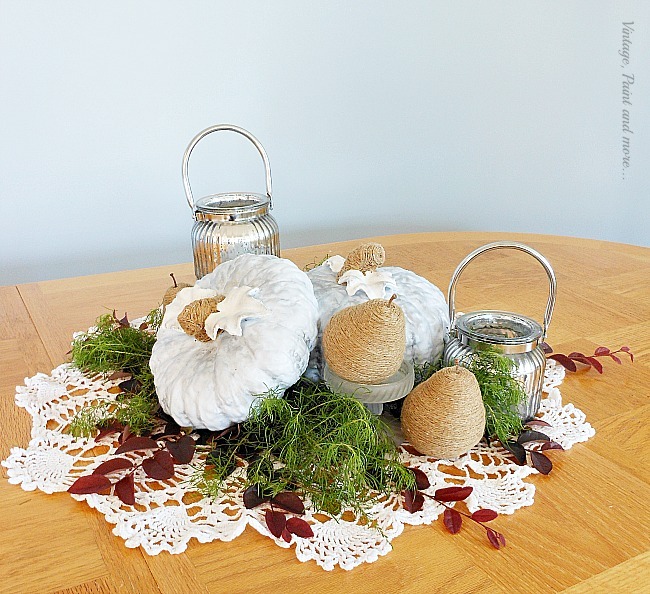 I painted the leaves with white craft paint and then wrapped the stems with twine. Here are the results of this quick little makeover. What a difference it made. 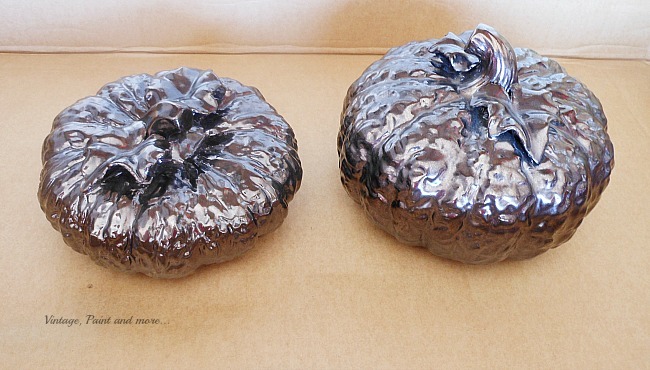 When I had finished all the painting I used a little metallic rub on paint (affiliate link) in silver to go over the edges of the leaves and on each pumpkins body to give it more interesting texture and highlights. What a transformation - from the blah brown to this gorgeous blue - love it!! As for the centerpiece - I started with a vintage crochet doily my Mother made when I was a child. 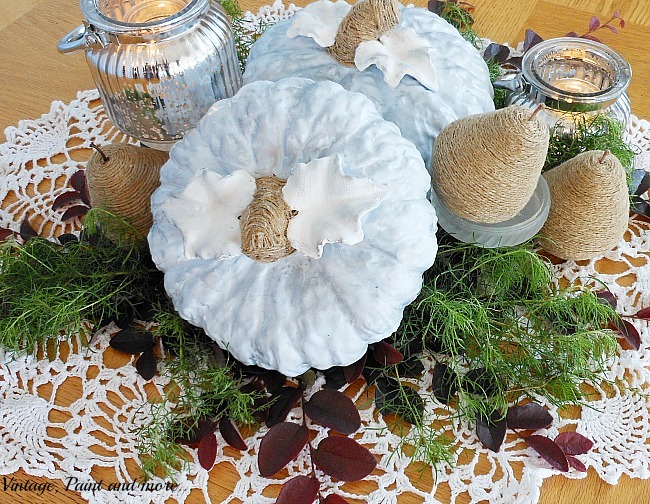 I placed some foliage from my yard on top of the doily and then placed the pumpkins on top of the foliage. 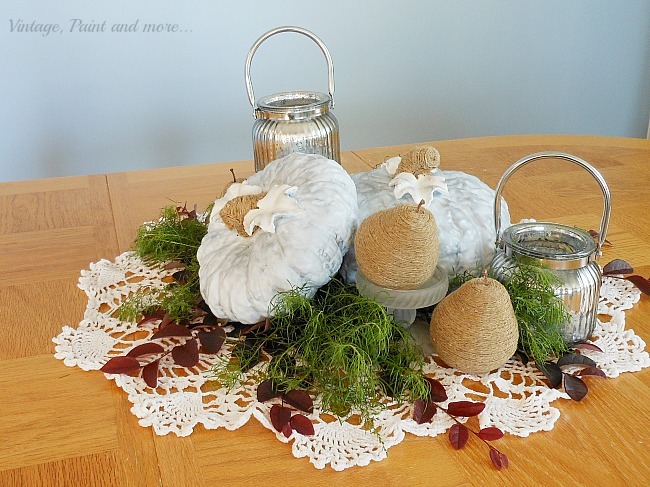 I then placed some twine wrapped pears I did around the pumpkins. I had two mercury glass lanterns I bought at Marshall's last year that I placed near the pumpkins. 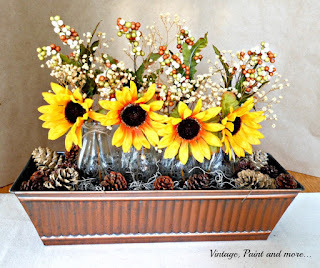 I think this makes the whole centerpiece look elegantly rustic with a vintage touch. This is a view from the top so you can see the placement of all the items I used. 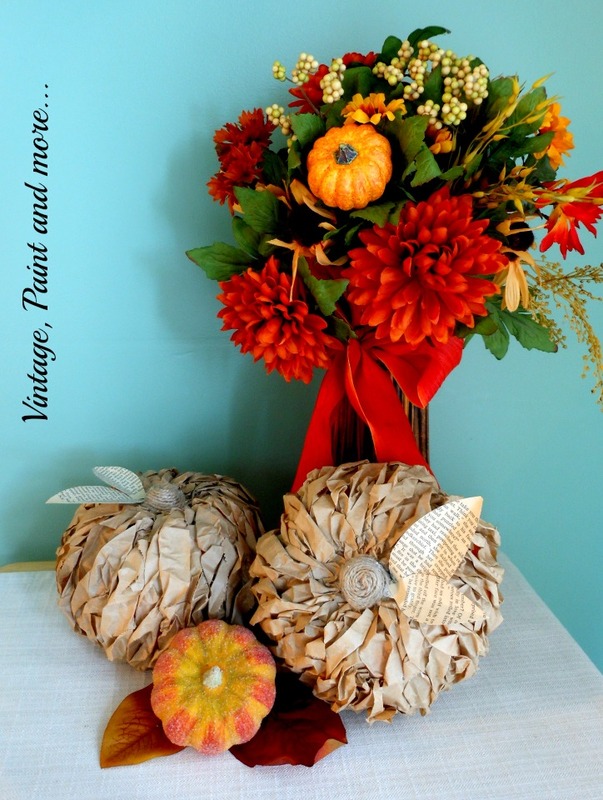 I love the blue on the pumpkins - it makes them resemble the heirloom pumpkins that are so trendy right now. Our dining room just recently underwent a transformation which I will share with you at a later date. I am working my blues into the decor so this centerpiece is perfect in here. What do you use for Fall? 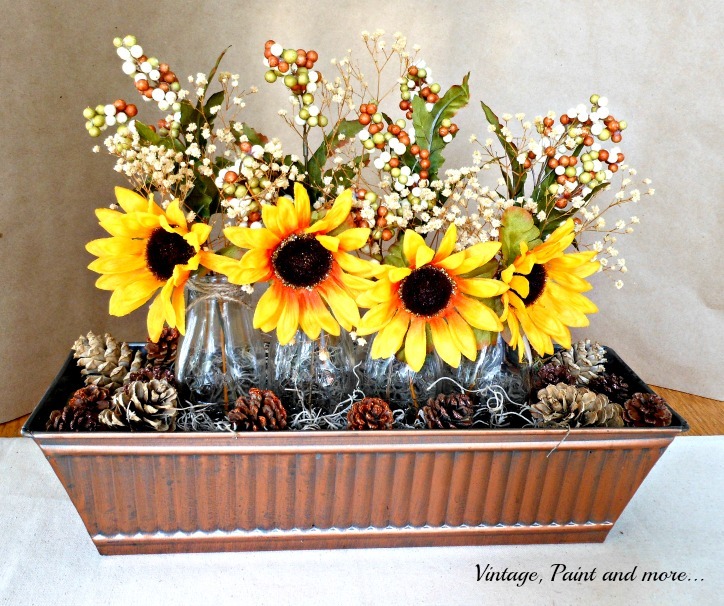 The basic rustic reds, oranges, and yellows or do you think outside the box and use less original colors like this? I love to hear from you so tell me about in the comments below. If you like this post you may want to sign up for my emails in the box at the top of this page so you don't miss any. Thanks for stopping by and until next time enjoy creating something you love. I will be linking up to the parties listed on the Where I Party page. 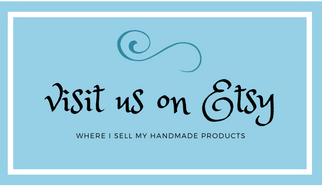 Be sure and stop by and check out all the amazing inspiration and creativeness found at each one. Thank you Cecilia - this is actually a blog hop and the link was only open for the participants to link up for a very short time. Thanks for stopping by. So pretty with the nice rich pop of colors and jute pears. I love the way the pumpkins turned out, nice work!! Thank you so much Michele - funny what a little bit of paint can do. Wow Cathy these are just beautiful...you did such an amazing job on these...Love ...Love...Love! Thanks so much Tammy and thank you for your sweet words. Such a huge improvement! I love the twine wrapped stems. They go perfectly with your pears. The twine wrapped stems were an afterthought but I am so glad I did them that way. Hi, Cathy! I love your centerpiece!! The pumpkins are totally different now, so cute with the leaves on top. And the crochet doily has brought some sweet memories of my grandma making some exactly as yours, she called them "piñas" which is pinecones in spanish. Thank you so much. My Mother made this doily so it is quite old. I have never heard them called that before - interesting. I think the pattern is a pineapple pattern. I love how you brightened up the pumpkins!! Thank you - a little paint did make a big difference. Amazing, they look great now! The new blue color gives your pumpkins a very special vintage look! And they go quite well with your décor and color scheme. 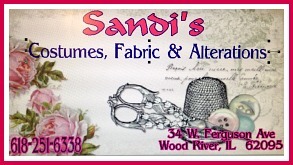 They're absolutely perfect with your precious doily! As for using less than original fall colors, you know I have to incorporate purple into my fall décor! Oh, not just for fall but of course, all the seasons! I have no problem doing just that! Lol! Thank you - it's one of my favorite shades - I use it on a lot of things I do. 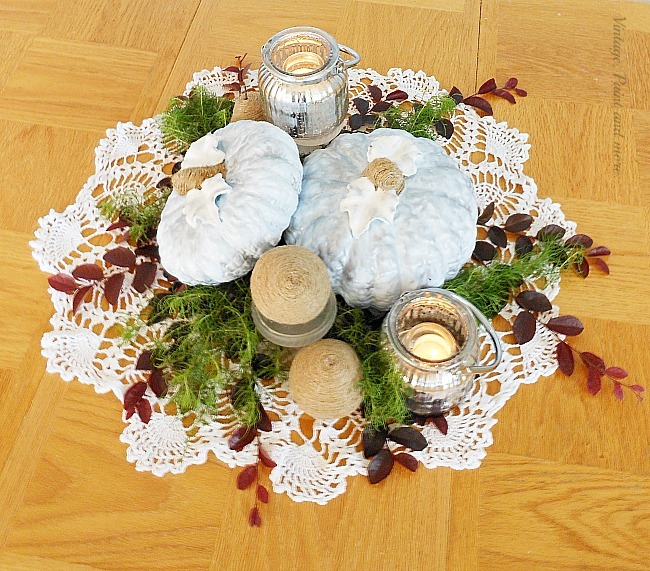 What a beautiful centerpiece Cathy, I love what you did with those pumpkins. I love finds like these that are just screaming for a makeover! Thank you. I am always scouring thrift stores for something to makeover - I love those kinds of finds. LOVE! Oh my goodness I love it so much! I love how you made over the pumpkins! 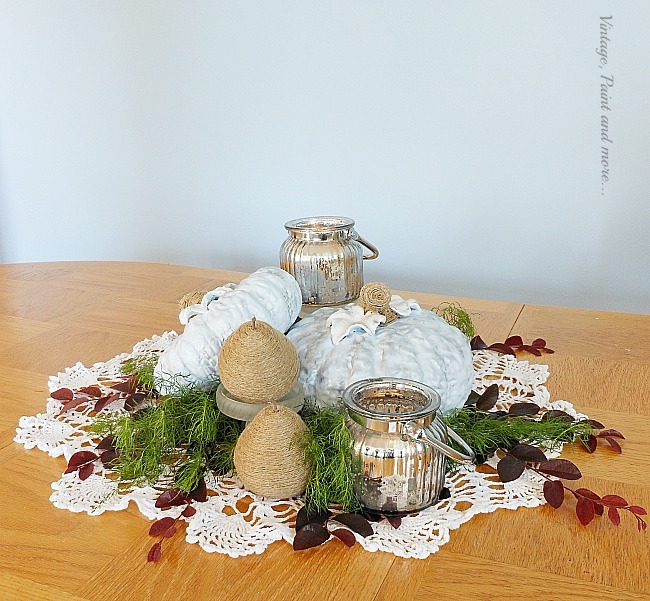 The centerpiece looks perfect for fall and Thanksgiving. Thank you so much Julie and thank you for hosting such a great party each week. Love, LOVE, L O V E the paint technique on the brown pumpkins!!! I can't believe these were a Goodwill find! These turned out so pretty I love that you used blue paint! Thanks so much for sharing at The Creative Circle Link Party. What a great makeover. The pumpkins look so much better! Great makeover Cathy! Thanks for sharing them with SYC. 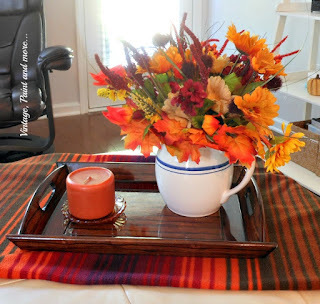 Very pretty centerpiece, thanks fro sharing this on Dream Create and Inspire. 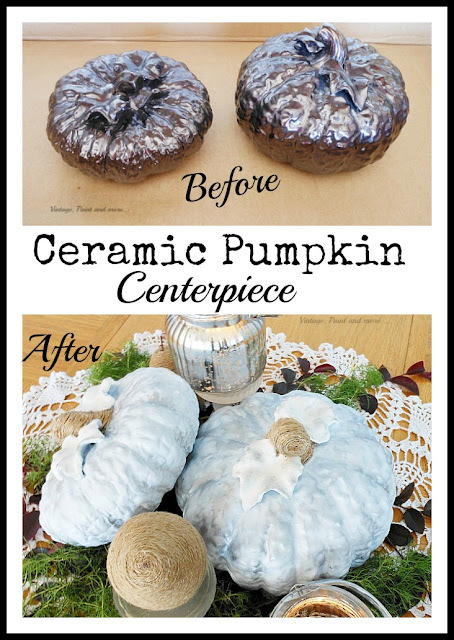 Hi, Cathy ~ Love this makeover, and those pumpkins look so much more bright and festive in their new color! Thanks for sharing with us at the Merry Monday Link Party! Hope to see you again on Sunday night! I'm so happy to inform you that I featured this at Monday's Cooking and Crafting with J & J! Thanks and we hope to see you again!